Wu Zhongfeng is making Mongolia marquetry works. Three masters share their thoughts on the development and promotion of traditional handicraft, Wang Ru reports. 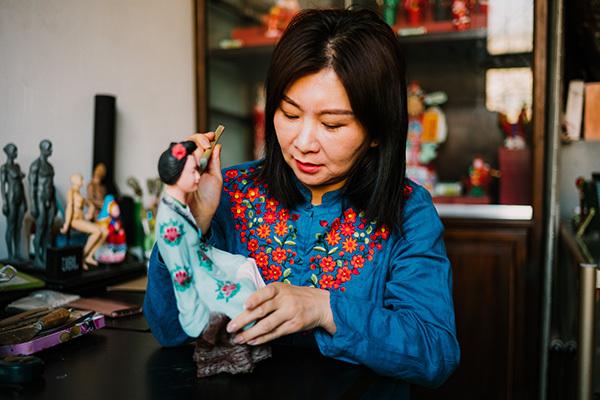 Wu's devotion to the craft for the past 40 years has turned her into an official inheritor of the intangible cultural heritage called "Beijing Mengxiang". 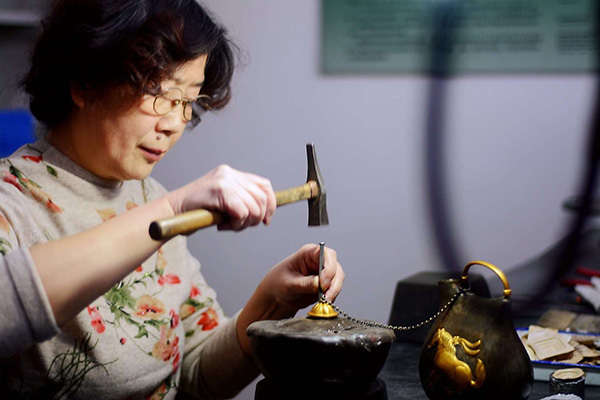 Along with two other masters, who specialize in lacquerware carving and clay figurines, Wu participated in an activity held by a Beijing-based association to promote the development of cultural heritage in the city on March 20. The Mongolian-style craft of inlay comes from the nomadic tribes of the Mongolian and Tibetan groups, who inlay precious stones for decorative objects by chiseling, carving, welding, gilding and polishing. The craft uses metal. Wu calls it a fire art, and stresses the importance of temperature in this craft. "That is the taste of mengxiang. We try to create works that have shine - gold or silver in them - but also a sense of history," says Wu. Li Zhigang is making lacquerware carvings. One of the "eight marvelous handicrafts of Beijing", lacquerware carving was also passed down from the royal court in the Ming Dynasty (1368-1644) and Qing Dynasty (1644-1911). 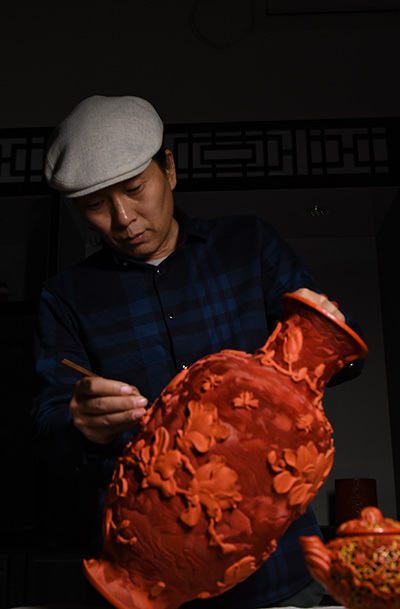 Li Zhigang, an expert of the carving, started to learn this craft in his teens. He introduced its history, dating to the Tang Dynasty (618-907), to the audience in Beijing this month. The craft prospered in the Yuan Dynasty (1271-1368), with Zhang Cheng and Yang Mao as two main masters at the time. It continued to develop both in the Ming and Qing dynasties but declined at the end of the Qing rule. After New China was founded in 1949, the craft began to develop again. Lacquerware carving needs to go through at least 10 production processes, according to Li. Simply the procedure of spraying paint on the body of the work takes over half a year. Craftspeople usually have to spray repeatedly for about 120 times in a room with the temperature at 27 C and humidity at 80 percent, making people feel like they are in a sauna. Though this craft has a long history, it has combined many modern elements today. A typical example is Qimu, an iconic work by Li that looks like a pregnant woman standing and staring into the distance.